What were you doing in 1979? Watching the solar eclipse, disco dancing, or maybe using the first-ever DustBuster? In Montclair, some very special women were meeting for the first time. Their mission: to beautify the natural landscape of the town and celebrate the spirit of their community. Betty Dallery and Jean Kidd were among the small group of residents with a simple, beautiful idea: plant bulbs in the fall and then, when the bulbs are blooming in the spring, distribute a calendar of special events around town. Donations from the residents would cover the cost of the bulbs and advertising from local businesses would pay for the publication. Now almost forty years later 'May in Montclair' remains a vital volunteer-driven initiative that beautifies the town and showcases the best of what the town has to offer. Bulbs by the thousands are ordered in September, arrive by November, and Vice Chair Cyndee Rowan (whose children are fifth generation Montclairians) transforms her garage into the tulip/daffodil depot where committee members bag, label, and deliver to eager volunteers planters all over town - in schools, gardening groups, park conservancies, houses of worship, and in the business districts. From Canterbury to Tuers, and Kaveny Field to Edgemont, the town fills the flowerbeds for a spectacular spring display. Volunteers are even more important this year than ever before. After forty years, the bulbs will be funded SOLELY by tulip donations. This year's Calendar of Events will appear here in the May in Montclair web site, and will also be distributed as a special supplement in the April 25th issue of Montclair Local. If you'd like to advertise your business in the supplement that will be mailed to all 16,500 households and businesses in Montclair, please view the brochure for details. Springtime events all around town continue to be showcased in the MIM website Calendar of Events. Opening day ceremonies will take place in Watchung Plaza on May 1st. The school children's musical performance will continue as a beautiful community celebration to kick off May in Montclair. May in Montclair is a celebration of the physical beauty and the indomitable community spirit of Montclair. 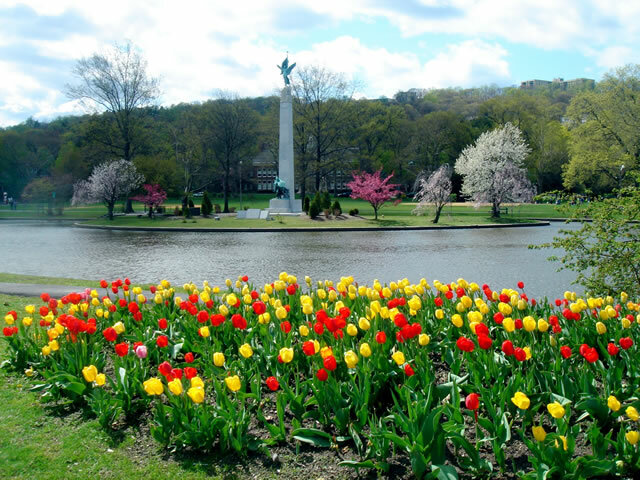 It is a month-long festival of art shows, concerts, garden tours, health and exercise programs, fairs and markets presented to make people feel good about living, working, shopping, and spending leisure time as they celebrate the spirit that is Montclair. Enjoy the Maypole Dance by students from Edgemont School and music performances by pupils from Edgemont School under the direction of Max Mellman, Northeast School directed by Shawn Dey, and Watchung School led by Henry Boote. Join us on May 1 for Customer Appreciation Day. Free Small Hot Coffee all day at both Montclair locations to thank you, our loyal customers, for 6 years on Bellevue Ave and 3 years on Church Street. A wonderful way to relax with potential for a side business, calligraphy is becoming more popular as we move away from the keyboard and back to the art of handwriting. This class, which is great for adults of all ages, will be held at the Montclair Public Library - Bellevue Ave Branch. What better way to begin the month of May than with song?! Join the chorus of The Woman's Club of Upper Montclair as these talented women usher in spring with music. Tickets can be purchased at the door. Our Annual Herb Sale is here! Visit the Montclair History Center’s Crane House and Historic YWCA and pick up unique, organic herbs for your garden. We will continue to offer a selection of heirloom vegetables in addition to our herbs. Pre-orders, available on our website, are due April 26. Pre-orders must be picked up on Thursday before 8 pm. Hours: Thursday from 9 am to 8 pm; Friday from 9 am to 5 pm; Saturday from 9 am to 3 pm; Sunday from 9 am to 3 pm or until we sell out. Become a member of the Montclair History Center while you’re at the sale and receive a free herb. Some thing wonderful is happening for this year's Spring Art Walk in Montclair! We are joining up with the Montclair Art Museum and Studio Montclair for a town wide celebration of the arts. The date has been changed to incorporate First Free Thursday at MAM. One mile of the arts from east to west! The chorus returns with songs of love, loss, and inspiration. Directed by Fran DePalma-Iozzi with accompanist Rebecca Eng, piano; Dr Lou Iozzi, saxophone and flute; and Frank Mazzeo, percussion. Don't miss this picture perfect evening in the gardens! Enjoy cocktails and hors d'oeuvres at Van Vleck House & Gardens and gain premier access to the unique blooms available at the annual Plant Sale before it opens to the public. Better nutrition and parenting strategies turn parenting burnout to motherhood bliss. Prevent nutritional depletion, rebuild the body, improve family relationships, and take home critical tools that prevent mommy burnout. Enjoy an introduction to the fine art of making petits fours.Learn how to make a frangipane cake and the proper glazing and decorating techniques. Baking enthusiasts from teens to seniors will want to huddle in the kitchen at the Unitarian Universalist Congregation in Montclair. In May, our local parks are loaded with colorful spring migrants and local residents nesting, courting and feeding. Take a two-hour stroll each week at a different location to seek out some lovely birds. Bring binoculars and bug spray. Class meets rain or shine. Birders, hikers and animal lovers are welcome.